Jamaica Drink Concentrate by Fiesta 16 oz. 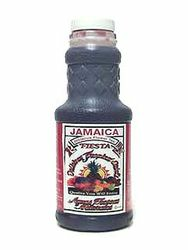 Concentrated package of Jamaica drink, flavored with hibiscus-like flower. A 16 oz bottle of concentrate makes about 1 gallon of your favorite flavor. Dried hibiscus flowers, known in Mexico as jamaica (pronounced "ha-ma-ike-ah", rather than like the name of the Carribbean island country) have long been available in health food stores in the U.S. for making a tea that is high in vitamin C. With the advent of interest in south-of-the-border cuisine, hibiscus flowers are sold in bags. This drink is particularly good for people who have a tendency, temporary or otherwise, toward water retention: it is a mild and completely natural diuretic. Porci�n individual de jugo de fresa y pl�tano tropical. We used 5 bottles of this for my wedding to make agua de jamaica for a jamaica tequila cocktail as one of our "signature cocktails" at the reception. It was really easy to make and delicious!